Edit: Two things to add. First, a fun fact that I overlooked until after this article had been published: The years of 1879 and 2014 have an identical calendar. The 18th of December occurred on a Sunday in both years. Second, several commenters have corrected one of the captions below. The locomotive involved in this incident was, eventually, documented going over the new Tay Bridge. The night of December 28, 1879, might have been notable in meteorological history even if no other bad events had solidified their hold on that date. The storm that blew into the Firth of Forth area on that day was one for the record books, terrifying and destructive even by the normal standards the residents of Wormit and Dundee used to measure the regions’ frequent storms and gales. This date, though, would come to hold more tragic significance. Despite winds strong enough to uproot trees and topple stone chimneys from rooftops, passenger rail service operated by the North British Railway had not been halted or delayed as a result of the storm. At approximately seven fifteen o’clock, a lone train left Wormit for Dundee and began a slow trek across the Tay Rail Bridge. The iron bridge was almost two miles long, and had opened about a year and a half earlier to significant fanfare and publicity. Though it may have appeared as thin as a thread in the madness of the storm, the Tay Bridge was, at least for a few moments more, a symbol of technological triumph. Residents and local businesses had understood the usefulness of a rail link between Wormit and Dundee for more than a decade before construction actually began in 1871. Even those dreamers who understood how a the rail route could be improved, though, had considered it highly unlikely that the bridge would actually be constructed. 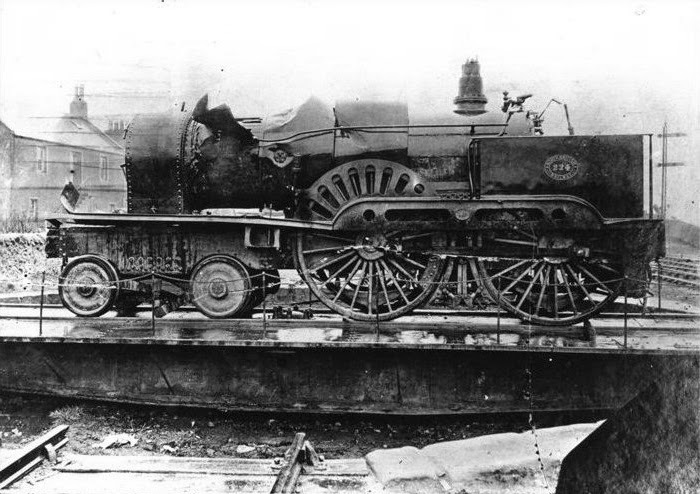 For years, economic battles between the Caledonian Railway, which had a virtual monopoly north of the Firth of Forth, and the North British Railway to the south had prevented officials from either railroad from signing off on new construction. Rail passengers and freight were forced to take a longer and more difficult route around the Tay. All doubts aside, the Tay Bridge opened for revenue traffic in June of 1878. 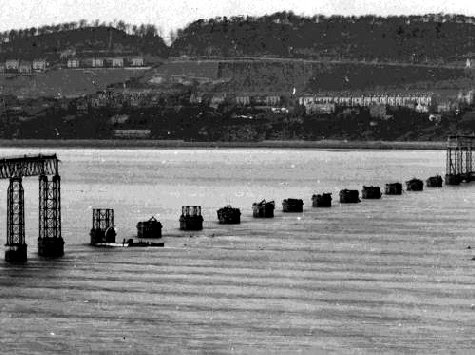 Passengers and freight shippers now had a direct link across the Tay, and quickly put the bridge to good use. It soon saw on average seven trains per day, and its busiest passenger trains carried around three hundred passengers at a time. To onlookers in 1878 and 1879, the future of the Tay Bridge seemed pregnant with possibility. There were exceptionally few members of the general public who knew that the inspector who had examined the bridge just prior to its opening had expressed concern that the effect of high winds had not been adequately considered when the bridge was designed, nor that workmen sent out earlier in 1879 had reported that some of the crossties had become loose and that a few of the supporting columns had sprung minor cracks. Certainly, none of the passengers on the train that approached the bridge on December 28 were aware of these premonitions. The gap where the "high girders" had been. 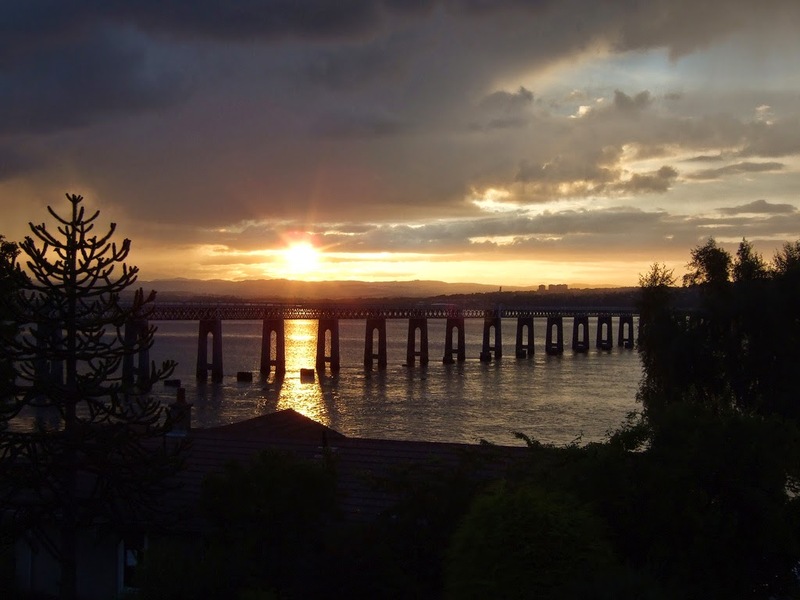 The geography of the surrounding land was such that in the daytime and on clear nights, residents in both Wormit and Dundee had a clear view of the Tay Bridge’s graceful curve across the waters. Though it was pitch dark by the time the train headed onto the bridge, peals of lightning occasionally allowed a crystal-clear view of the bridge, and roiling water lapping up towards the high girders. Some of the local residents of the two nearby cities watched the trains crossing the bridge as a hobby, but tonight, the eyes that tracked the train’s lanterns as they slowly crawled across the high girders were motivated by well-placed concern. At approximately seven twenty in the evening of December 28, several witnesses reported a bright flash coming from the bridge itself. It was far too reddish and too low over the water to be mistaken for a flash of lightning. The train’s lanterns disappeared after the light faded, and did not reappear. 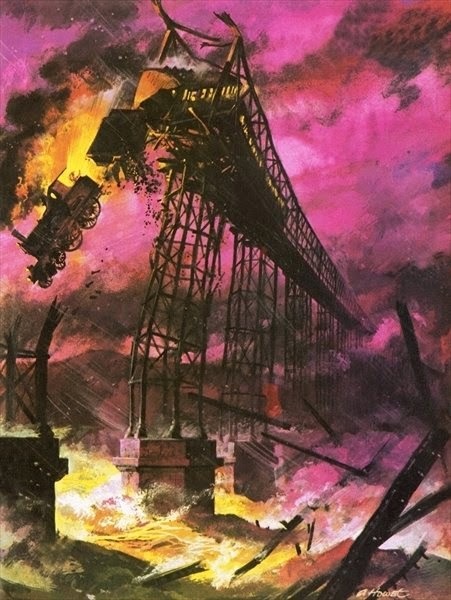 For a few minutes, the witnesses held their breath, then when the next genuine flash of lightning arrived, saw a gaping hole where the high girders--and the train--had been a few seconds before. The signalmen posted at the bridge outlet at Wormit had seen the flash, and were among the first to act. They immediately sent a runner to further investigate. He returned, breathless, and announced that the bridge had fallen. The news spread though Dundee and Wormit like wildfire. Several boat captains braved the waters to look for survivors, but none had any success. By one thirty in the morning of December 29, word had reached London via telegraph that the Tay Bridge had fallen and that none of the crew or passengers on the train had survived. first major incidents in which investigators could use photography to their benefit. The initial headlines reported more than 300 deaths as a result of the fall of the Tay Bridge. Had these numbers been substantiated, the disaster would have ranked among one of the worst rail disasters ever, even in the present day. However, in the confusion, journalists did not realize that the 28th had fallen on a Sunday, and that ridership on Sundays was usually far less than it was on weekdays. North British Railway officials scrambled to count the ticket stubs and arrive at an accurate casualty count. It has never been possible to definitively account for every rider and crew member, since some of the passengers held season passes that did not leave behind a paper stub, but the final death toll is generally agreed to be somewhere between 65 and 80 people. The loss of life was shocking enough and, for the British people of the late 19th century, made for an “always remember where you were” moment. There was more taken away than the lives of the passengers, though. 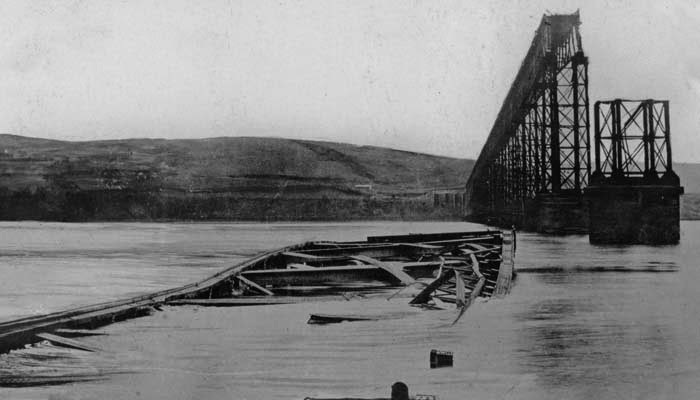 The Tay Bridge that lay in ruins had been a symbol of national pride, of technology developing to a point where industry could simply overcome inconvenient aspects of nature. The failure of a bridge that had been hailed as a triumph of engineering could not be written off as an act of god. As the passengers’ bodies and personal artifacts began to wash ashore and the fallen girders were dredged up, there also rose up a demand to know why the tragedy had occurred. What followed was one of the first examples of a disaster being examined in a forensic manner, with the ruins examined and cause and blame assigned based on the results. Thomas Bouch, still in shock after hearing the news, claimed in his defense that the train must have derailed and caused fatal damage to the bridge. The Court of Inquiry that convened almost immediately after the disaster took his theory into account, but found no evidence to support it. The way that the wreckage had come to rest showed that the bridge had broken into pieces before it fell, not as a consequence of impact, and did not reveal any signs that the train had come off the rail. It had been traveling across the bridge at such a slow speed that it was unlikely to cause significant damage, even if it had derailed. What the Court of Inquiry did find was far more damning to Bouch's reputation. An inspection of the remaining pylons showed that the masonry work was subpar, so the bridge supports were not satisfactorily adhered to the river bottom below, and the metal bolts attached to the masonry had a high failure rate. In addition, many of the bolts had been attached poorly, or improperly, which allowed the bridge to have more torque than what was within the allowable safety range. eventually put back into service. However, NBR drivers refused to take it over the bridge again. Bouch defended his design against these charges by claiming that none of the construction workers had not informed him of these shortcomings, and he could have easily remedied them if he had been made aware. The evidence that continued to come out during the Inquiry’s investigation, though, only tied him more closely to the Tay Bridge’s fall. Testing on the steel used on the bridge, and cast by a foundry directly under Bouch’s supervision, showed it to be of poor quality and below the weight rating needed for the bridge’s usual load. Several other bridge building engineers called to testify by the Inquiry stated that in their opinion, the design of the Tay Bridge was deeply flawed, and several workmen and frequent riders testified that they had observed signs that the Tay Bridge was already showing signs of structural failure before the accident, and that the repairmen were not properly trained to maintain and examine the Bridge’s ironwork. Finally--and most damning to Bouch’s reputation--his designs did not account for the effect of high winds on the bridge structure. It was an unforgivable oversight, given the weather common to the area. Thomas Bouch was broken by the failure of his last bridge, and died within a year of the disaster. Several of the other bridges which he designed were declared unsafe before their projected lifespan had elapsed. The reports from the Court of Inquiry recommended that future bridges take wind into account to a far higher degree than had previously been considered acceptable. The Tay Bridge was replaced, and traffic for the new bridge opened in 1887. This structure is still in use in the present day, and at low tide, the pylons from the original bridge still protrude from the water.